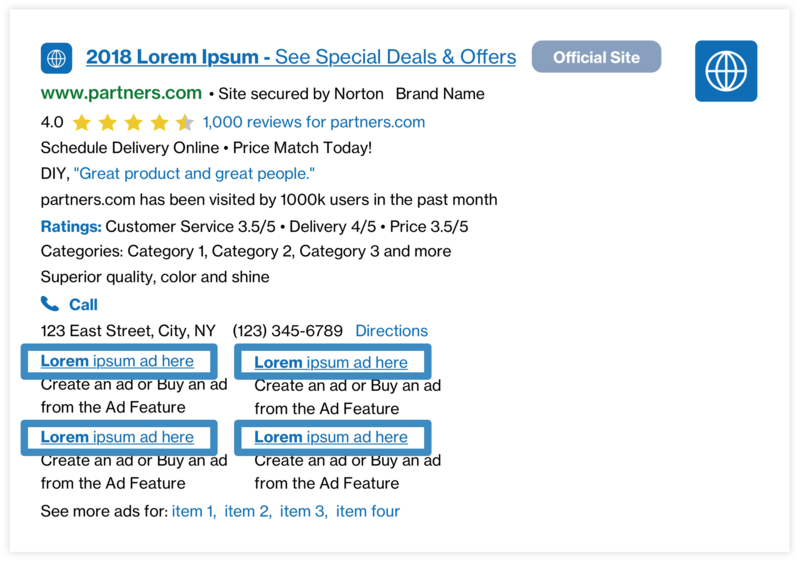 Sitelink extensions are additional text and URL pairs (up to six) that provide deep links to an advertiser's website. These links provide more specific access points to the advertiser's website in order to drive users to the exact information they are looking for. Results: Some Partners have seen an estimated lift of +15-25% CTR. Results may vary. NTCount=n: The parameter can limit the maximum number of ads with Sitelink extensions. "n" can be 1, 2, 3 or 4. If a value is not specified, the default is 4.
maxChars=n: The parameter sets the width available to display Sitelinks. "n" is the number of characters for one line with the default value of 71 (characters). We don't suggest Partners send this parameter if their ad units are wider than 71 characters. It will change the layout recommendation. Related Case Study: Learn how our Partner, Xerocole, used Sitelinks to increase CTR by +5-10% and increase RPM by +12% here.